Interactive channels continue to prove their worth for revenue generation and customer engagement, but the growing complexity and volume of digital interactions cause analytics challenges. Traditional techniques such as web analytics were not designed for the breadth of channels, devices, and speed that fuel today's digital interactions. The underlying design of web analytics is fundamentally inadequate to accommodate emerging channels, sophisticated consumers, technical challenges, and the democratization of analytics within data-driven enterprises. 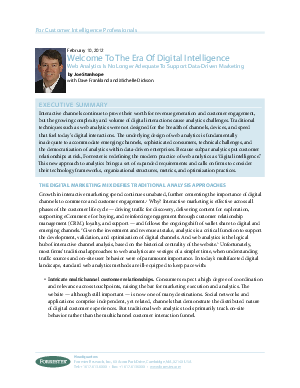 Because subpar analytics put customer relationships at risk, Forrester is redefining the modern practice of web analytics as "digital intelligence." This new approach to analytics brings a set of expanded requirements and calls on firms to consider their technology frameworks, organizational structures, metrics, and optimization practices.